SRI (System of Rice Intensification) is environment-friendly and delivers a higher yield compared to conventional planting methods. It is also proven to be sustainable as this method uses less quantity of rice seedlings and less water during their growth cycle. 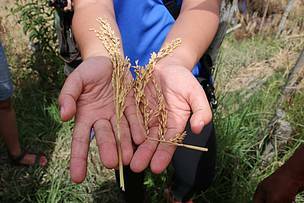 Ba’ Kelalan, LAWAS: A group of farmers here finally harvests their much awaited Adan rice, planted using chemical-free farming method called, System of Rice Intensification (SRI). This is made possible under a pilot project by WWF-Malaysia through a RM1.5-million funding by CIMB Islamic Bank Berhad (CIMB Islamic) in a three-year partnership (2017-2019). In Ba’ Kelalan and Long Semadoh, Sarawak, the total allocation is RM600,000. SRI is environment-friendly and delivers a higher yield compared to conventional planting methods. It is also proven to be sustainable as this method uses less quantity of rice seedlings and less water during their growth cycle, as well as enables easier transplantation of young seedlings, more effective weeding control and more fertile soil conditions as organic fertilisers are applied. In 2014, Department of Agriculture Sarawak (DoA) introduced SRI farming in Long Rusu village of Ba’ Kelalan with five farmers joining the three-year test plots programme under its Agriculture Research Centre. WWF-Malaysia was also involved in the programme, which is aimed at promoting chemical-free farming while also reducing pests such as the golden apple snail. WWF-Malaysia and CIMB Islamic sponsored local farmers to participate in DoA’s programmes, which included visiting the SRI Lovely Farm in Sik, Kedah to learn about the theories and technical aspects of SRI. In 2017, SRI farming expanded to Long Langai village, with 11 farmers committing to the project. An expert in SRI, who runs the SRI Lovely Farm, Captain (Rtd) Zakaria Kamantasha has been engaged as an advisor to the project. Zakaria said the difference is obvious with the plants or seedlings producing more tillers than usual. “In Ba’ Kelalan, a plant only grows 10 to 20 tillers but with the SRI method, we are witnessing an average of 50 to 80 tillers. This is a good record. The farmers have patiently and diligently adopted the sustainable farming method using more environment-friendly agriculture practices,” he said. The farmers at Long Langai started their paddy planting in July 2018. WWF-Malaysia organised workshops, on-the-ground training and follow-up activities on SRI under the guidance of Zakaria and officials from DoA. This has enabled interested farmers to learn more about environment-friendly agriculture practices, i.e., integrated nutrients, pest, disease and weeding management, and exchange experiences with each other. The farmers then started their harvesting in January 2019. "This SRI method means a lot to us and also motivates us to work harder in improving the yield. Although we have yet to finish harvesting, I can already see my SRI paddy plot is flourishing with more rice grains to harvest. Under SRI, quality tillers are ensured through line planting and good aeration," Baru Agung, one of the farmers said. “At first, we thought that the SRI method was labour-intensive because we have to spend more time, energy and effort to monitor and manage our paddy field. Nevertheless, we accepted the challenge and stayed committed. Thanks to God, hard work does pay off. We are satisfied with our extraordinary results,” Harrison Sakai, another farmer added on. 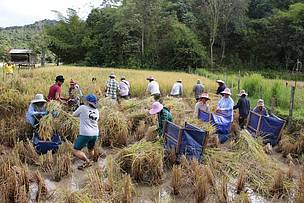 WWF-Malaysia promotes sustainable rice farming by local communities as a means to reduce impacts of their agricultural practices on the environment. The project adds value to the ecosystem services such as the provision of clean water for irrigation, by minimising upstream land use changes such as unsustainable logging or large-scale forest conversion to agriculture. Farmers working together (gotong-royong in Malay language) to harvest a SRI pilot plot.